I wrote this post several years ago. At the time, I didn’t foresee my country entering a period of such gross animosity. In the last month I’ve taken long breaks from social media, removing apps from my phone, even though aspiring writers are supposed to play the platform building game. If I want to get published, I’m expected to “join the conversation” (that’s a laugh), keep posting to hopefully make myself relevant (also a laugh). But all that debate and hate has thrust my anxiety to unprecedented levels, especially when I see Christians routinely taking each other to task, putting other believers in their place. Why do people who claim Christ believe it’s acceptable to mirror the world’s hate when they discuss grace and social justice, or Calvinism and Arminianism? I’m worn out from all the noise. When I returned to this piece that I’m posting today, I was glad to be reminded that Jesus’ reign is a supernatural one which ushers in unprecedented peace. This passage is so packed full of greatness–I’m not sure where to start! I’ve only had a little bit of time to dig into the details here, but what I have learned is interesting. The end of chapter 10 is the prophecy of the destruction of Assyria, who had carried Israel into captivity. Isaiah describes Assyria’s fall as a permanent one. God Himself would fell the cedars of Lebanon, which in this case symbolically represent the Assyrian army. What I would never have known had I not looked it up for the sake of this post, is that cedar stumps do not produce shoots. In fact, a felled cedar will die slowly. By contrast, an oak tree stump will grow “sucker” stems. David’s dynasty came crashing down, but unlike Assyrian rule, this is not the end! From David’s line comes the Messiah. It’s also interesting that Isaiah does not specifically mention David in verse one, rather he reaches one generation back to Jesse. Why? I don’t know what the scholars have to say, but here’s my take. The stump can create a bunch of shoots–not unlike Jesse who had a gaggle of sons. If you recall the story, Jesse had not bothered to call David in from tending the flock when Samuel came to anoint the king. David was the youngest and seemed the least likely candidate for so lofty a position. Now, what about the birth of Jesus? Who would have supposed that a child born so poor was divine, a king whose reign would never end? The passage continues to describe how the Holy Spirit would rest on the Messiah. Jesus would house the character and identity of God, not just be intermittently inspired by the Holy Spirit as the ancient prophets were. His rule, then, would bear the qualities you would expect from God. He would be wholly just and righteous, being an advocate for the oppressed and slaying the wicked. My favorite part of the passage is what follows. Again, I haven’t done a ton of study, so I’m no expert. But one commentator described this section as a description of the church of Jesus Christ. From that perspective, the different animals represent the diversity of the body of Christ. Even more telling, the violent and the victim come together for worship, and they are completely at peace with one another. Jesus’ reign, having been initiated by grace and forgiveness at the cross, will be one of unimaginable peace. It is so unlike anything we’ve ever known that it can only be described in terms that are almost laughable. A child reaching its hand into a snake’s nest? Ridiculous! But that’s what we’re in for, followers of Christ–peace which can only be achieved by the supernatural moving of the “Mighty God, Everlasting Father, Prince of Peace” (Isaiah 9:6). As I continue through these Advent readings and unravel the levels of history and prophecy, I sense God’s voice saying, “I have done great things. I AM doing great things. I will do great things.” What does that mean for you? If you are a follower of Christ, that means that you are a part of great things brought about by a great God whose love rescued you from great peril. 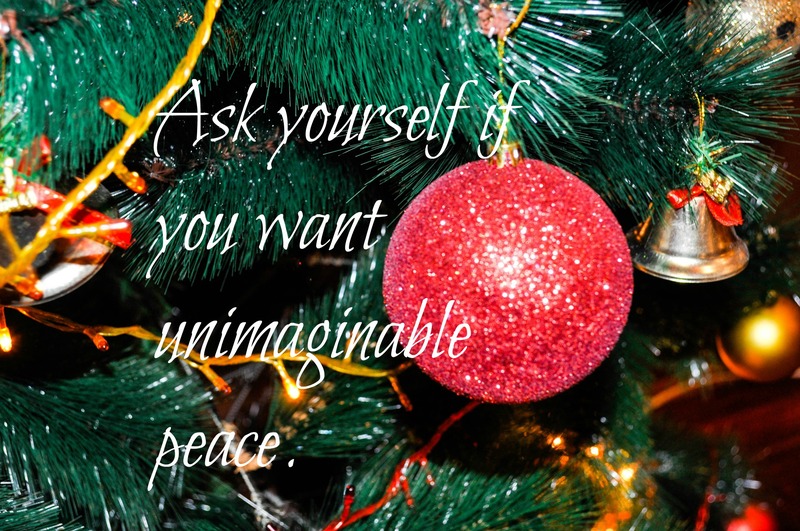 If you don’t know the Lord, ask yourself if you want unimaginable peace. Then place your faith in the Lord Jesus and be a member of His family. Friends, I pray that this Christmas, more than ever before, you will be confounded by the power and love your Savior. May we all enjoy a silent night with sweet dreams! More tomorrow.